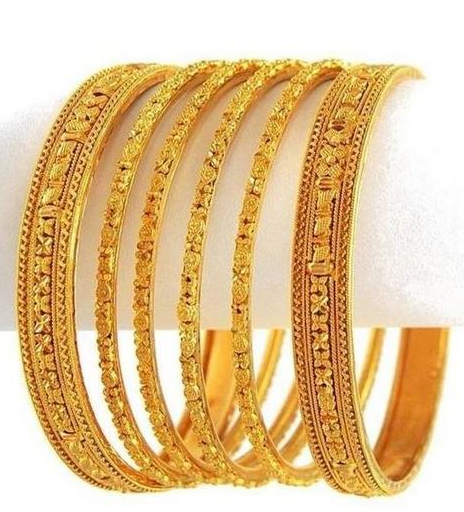 Gold bangles, over time have become much trendier to suit a more contemporarylook, but they are still as significant as they were millennia ago. Bangles with geometric designs give them a funky look, however , for traditional ceremonies only circular glass or matel bangles are preferred. People in different states of the country call them by different names. But, they have equal importance in india wedding tradition, not with standing the geographical boundries. Every region has a separate set of ritual that are associated with bangles. Would-be- brides wear the smallest possible bangles with the help of oil. This signifies that her married life would be full of love and affection. 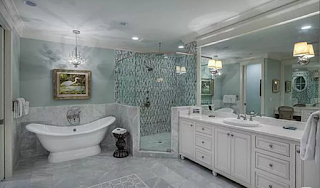 In the southern states, glass is considered extremely auspicious. 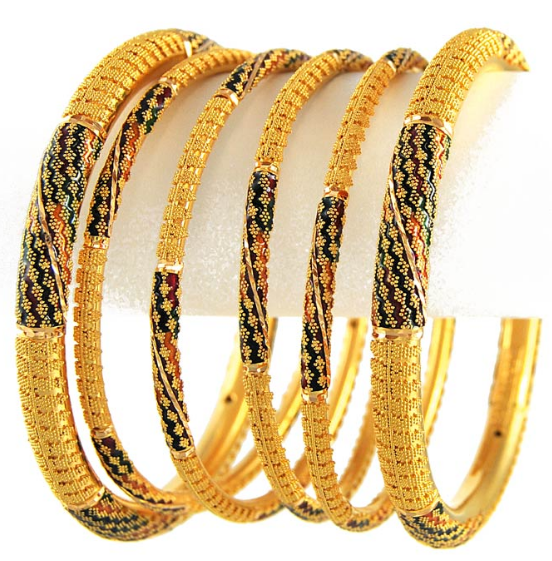 In some communities, the brides wear green coloured glass bangles along with the gold ones, since green signifies fertility and prosperity.In bengal, a new bride wears a conch shell bangle and a red coral bangle, which are locally called shakha pola.Apart from this, the mother-in-law gifts her daughter-in-law a gold plated iron bangle the moment she enters her new household. In Rajhastan and Gujrat, the brides wear such ivory bangles or chooda as well. In Gujrat, the brides maternal uncle gives her the chooda in a ceremony called mameru, along with the bridal silk saree with the red border. In Punjab brides-to-be wear ivory and red bangles called choora. The maternal uncle of the bride gifts her a set of chooda. She is supposed to wear these bangles for a given period of time, and they can wear these for a minimum of forty days or longer depending on the individual family's custom.In Maharashtra, the bridal chooda is significantly different. The bridal wear green glass bangles in odd numbers. The green signifies creativity, new life and fertility. They wear these along with solid gold bangles called patlya and carved kadas called tode. 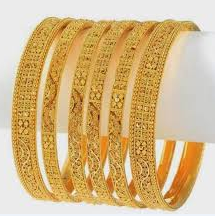 The gold bangles are usually gifted by the groom's family, in india and according to the traditions and customs. Wearing bangles is a must for a married woman. 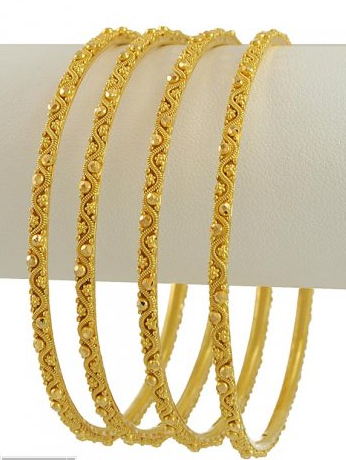 In some communities there is a belief that a golden bangles should not be worn alone, so they are teamed with some glass bangles which symbolizes the well-being of her husband and sons. 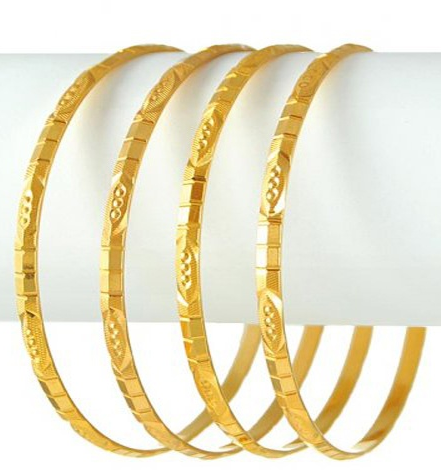 In some communities women are so superstitious that when changing the bangles they don't remove all the bangles making their arms completely bare. They keep atleast one bangle to the arm until they wore another set of bangles. Thay believe empty arm brings bad luck. 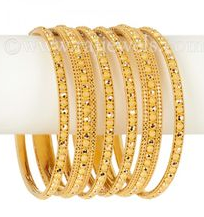 The tradition of wearing bangles in india started way back in ancient times. 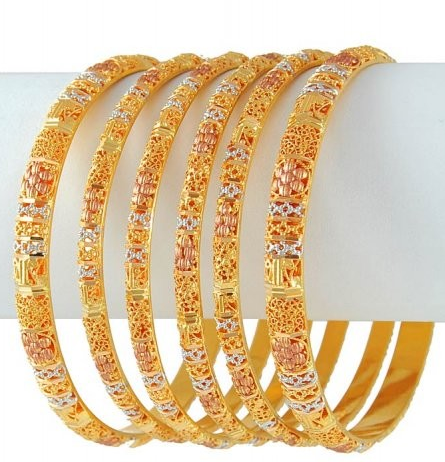 However, even today, women love to wear bangles to enhance their feminine grace and beauty with the help of bangles that are available in various colors and models. 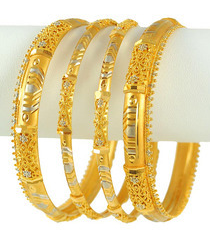 The word bangle has been derived from the hindi word Bangri or Bangali. Which is sanskrit gives the meaning "The ornament which adorns the arm.For Indian women, bangles are not just mere ornaments, indian women love their bangles. It's a tradition to wear bangles after marriage for the sake of health, luck and prosperity. 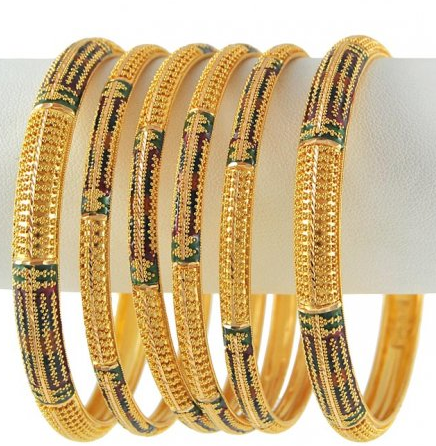 Bangles are more their accesories for indian women. They are a part of their identity.